Matt - One of the things I became fascinated in were some regular ridges on the surface of the icy plain of Sputnik Planitia, which appeared for all the world to look like dunes. Adam - So Like sand dunes like we have here? Matt - Yeah exactly. And that was one of the crazy things because we looked at that and thought well this is such an amazingly different world in so many ways. We're looking at a landscape at minus 230 degrees C, and yet we have got these features, not just the dunes which look so familiar but we've also got mountains, we've got glaciers we've got so many things that look so familiar in this alien environment. Adam - And what are these sand dunes made of. Because they're not made of silica like our sand is right? Adam - That means they're made of what comes out of your cooker essentially, natural gas? Matt - Essentially yes that's it. Adam - How do they form? How do they get there in the first place? Matt - Well that was the bigger mystery. Once we'd identified the fact that they certainly looked like dunes, we then had to go about explaining how that could possibly be the case because the issue we've got is that we've got such a thin atmosphere on Pluto it's something like 1/100000 th the atmosphere on Earth. Then the question became how is it possible to have enough wind to mobilise grains of methane ice to form dunes in first place. And what we realised through a combination of numerical modelling and observational work was that once these grains were started to move in the air we could keep them going. But the problem became how did we get them going in the first place? And that we realised was caused by a different process. This relates to the sublimation that these mixed ices. Adam - Like when the sun hits it turns the nitrogen from solid nitrogen right into a gas straight away? Matt - Yes absolutely. That's right. So because the nitrogen ice will sublimate first, as it turns into vapour in the atmosphere, it will loft, it will lift up these these methane grains. And there's probably enough sun as well to start operating some of the methane. But the key is because the nitrogen will go first it will lift these methane grains up and then although the winds are relatively weak and relatively low speed there's enough of them. We've done the modelling work. There's enough of that wind to keep it moving once it starts going. Adam - Do you think Pluto has much more to show us? Matt - I think there's a lot more to learn from Pluto. Of course, the difficult bit is that that mission was 10 years in the planning, nine years in flight time so we're looking at a 20 year lead in time for a mission out to Pluto. 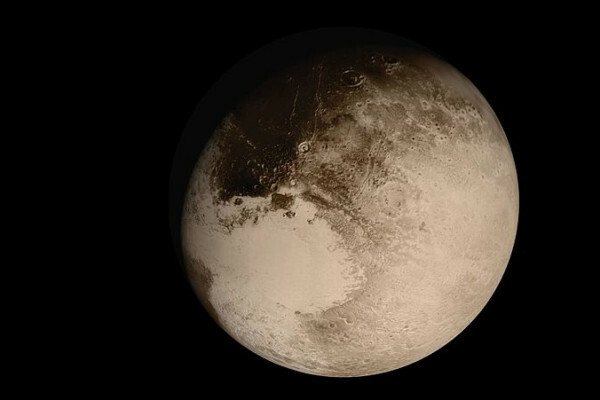 There are no immediate plans for anything else to go back out to Pluto. So really what we've got from that amazing flyby in the summer of 2015 is, is really what we've got to work with for now. One of the key things for us now is to dig further into this process of lofting grains by sublimation which is what appears to be happening at Pluto because that is something really new that's, that's a new process, a new mechanism but we haven't really observed elsewhere in the solar system in quite this way. Adam - Just to ask, on the whole is Pluto a planet. Where do you stand on that? Matt - It's funny. This is a question I've been asked more than I imagined. I'm not a big one for arguments, my general excuse here is to come out with “I like the term world.” I’m not going to sit on the planet, or the planetoid, or the dwarf planet fence. I’m just gonna to think of it as a world because I think that encapsulates the fantastic diversity of the landscape that we see out there. It really is another world it's not just an icy blob out in space it's not just a snowball out on the outer reaches of the solar system.